Your little guy will be the talk of the evening when he shows up wearing this adorable khaki bow tie set! These faux leather suspenders and khaki bow tie are perfect for a ring bearer outfit, birthday party, cake smash, wedding, family photoshoot or other special occasion. The bow tie comes in 2 attachment options- on an alligator clip (best for squirmy little guys who aren't patient while dressing) or on an adjustable elastic band (better for older children). 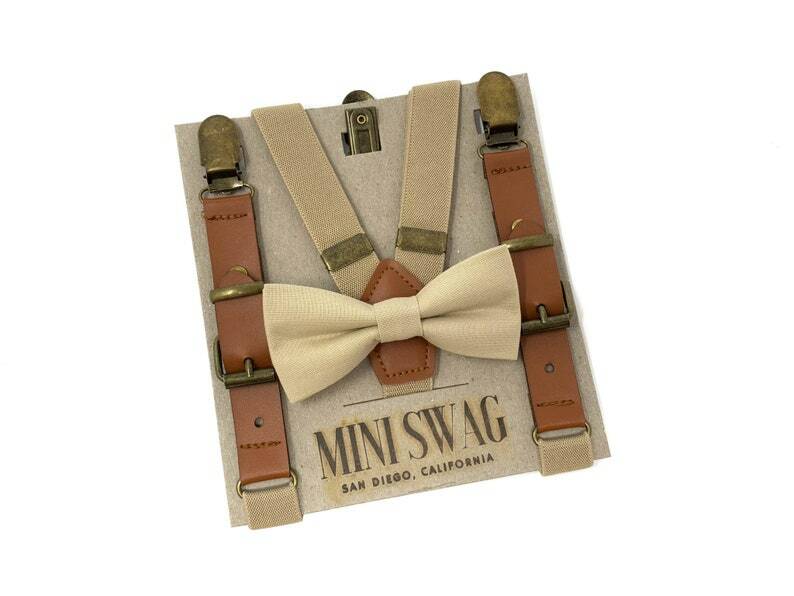 These kids vintage look suspenders are made from PU faux leather, tan elastic and antiqued hardware. This listing is for one pair of PU faux leather and brown elastic suspenders, but we carry 24 different color options in our other listings if you are looking for another color. Super cute! Love the quality.